We’re challenging ourselves to have 25,000 different gospel conversations over the next two years. What does that look like? 25,000 different gospel conversations breaks down to each of us having one gospel conversation per week for two years. What is a gospel conversation? Vintage Church is defining a gospel conversation as a spiritual conversation that leads someone to take next steps with Jesus. The point is to empower each of us to realize that we can all have conversations with people that help them take next steps toward following Jesus. If you know Jesus, you can share Jesus with someone else! God’s Design: God created a world that worked perfectly, where everything and everyone fit together in harmony. Sin: Unfortunately we ignore God and do things our own way, distorting God’s design and separating ourselves from God. Brokenness: Our sin leads to brokenness and we try different things to fix it on our own. Gospel: The remedy for our brokenness is the gospel—the life, death, and resurrection of Jesus. Jesus did for us what we cannot do for ourselves thereby rescuing us. Repent & Believe: We must admit our sinful brokenness and ask God to forgive us. When we do, we trust Jesus to save us from our brokenness. Recover & Pursue: When God restores our relationship to him, we begin to discover meaning and purpose in a broken world. Now we can pursue God’s design in all areas of our lives. Regardless of who you are and where you are in your faith, these simple truths provide easy but practical talking points for anyone. And the point of 3 Circles is to help us have gospel conversations, knowing that we all have situations where brokenness creeps into our lives. Whether it’s something affecting all of us in our world (e.g., terrorist attacks, hate crimes, murder, etc.) or it’s something very personal (e.g., loss of loved one, broken relationship, depression, etc. ), 3 Circles provides us with ways to engage all brokenness. 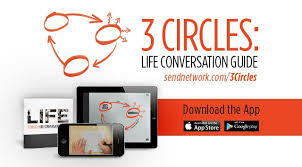 One of the great things about 3 Circles is that there’s a mobile app that we can use. Whether you use Apple or Android, you can download the app and use it on your phone when having gospel conversations. There are also several helpful videos and booklets on the 3 Circles website. These tools not only help you understand all the elements of the 3 Circles and how to use it but also provide you with a helpful tool you can use when having gospel conversations. Regardless of who you are, where you are, and what you are doing, you can have a gospel conversation. We all can have gospel conversations. Let’s challenge ourselves to share the good news of Jesus Christ, and let’s remember we’ve been empowered and equipped by the Holy Spirit to share this message with those who need it. As part of the Anticipate Initiative we are encouraging people to have consistent gospel conversations. In this interview Pastor Dustin unpacks what gospel conversations are and introduces some key resources available. For more information on ANTICIPATE, visit http://anticipatenola.com.